This semester is my final semester of library school (YAY!) and thanks to some careful planning and a lot of luck, I get to take a YA lit class. This class is going to be so much fun - I can feel it…except for the fact that the professor has already given us three assignments (Boo!) all due on the first day of class. The only good thing about the assignments is that they involve books (of course). My favorite assignment, or maybe I should say the one I disliked the least, was the one in which we had to write about our favorite books as teens. We were limited to five and it was surprising easy to pick my five favorites. Now I was a teen back in the 90s, I graduated high school in (deep breath) 1996…and back then YA wasn’t really as varied or prolific as it is now. In fact, my local library had about 9 shelves or so of Young Adult books. I remember this very clearly because I was a library page and would look wistfully at those shelves as there was almost never anything to put away. Needless to say, many of those books didn’t go out often. When I was in high school, I was more into books that could be found in the adult stacks. In English classes we read Shakespeare, F. Scott Fitzgerald, Pearl Buck, Carson McCullers, Steinbeck, Poe, Arthur Miller, Ibsen (among others) and lots and lots of poetry. Outside of school I remember reading Interview With the Vampire, John LeCarre spy novels, Ernest Hemingway, Ray Bradbury and lots of romance (an aunt introduced me to Danielle Steele at the tender age of 13). But eventually, I wandered back to those 9 shelves and that’s where I found authors like Paul Zindel, Cynthia Voigt, Bette Greene, and Robert Cormier. 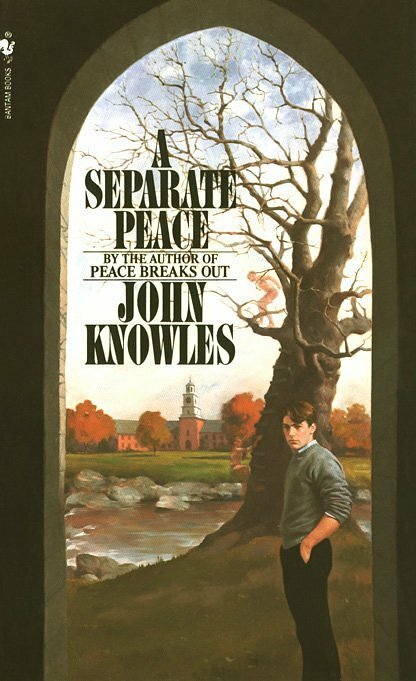 Then I was given a box of books by a cousin leaving for college, in that box I found The Outsiders (which I never really liked, I know I know, it’s the book that changed YA lit for the better, but I could never get into it), Rebecca, Catch-22, Ethan Frome and finally A Separate Peace by John Knowles…and my first literary crush. - Yes, that’s right, my first literary crush comes from a book about life at an all boys, boarding school during World War II. Pretty much, as soon as Gene introduced Phineas I was a goner. He was the first male character I remember having green eyes…yup, that’s pretty much all it took…green eyes and his casual disregard for authority and order. Finny made his own seemingly arbitrary rules and expected everyone else to follow them. My favorite scene was when he and Gene go to the beach and end up sleeping outside. Their talk about best friends shed so much light on Finny as a character. Finny is so wholly himself that I could never quite pick an actor I thought looked like him. -I’m not sure if I’ve mentioned how much I love reading books set in the South. 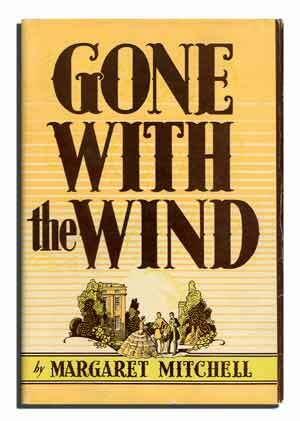 It’s all because of Gone With the Wind. It was assigned as part of a summer reading list one year and despite the length (it comes in at over 1000 pages) I had to read it. The description of Tara, the O’Hara family home, the quiet beauty of the Georgian countryside and then the bustle of Atlanta had me mesmerized. Then there are the characters: Scarlett and her many suitors, including Ashley and Rhett, and Melanie (who I actually liked more than Scarlett). The fact that Scarlett didn’t give up in the face of tremendous hardship gave me hope that I too could conquer anything. This is the one time where I like the book and movie equally. Even though the movie left out or reduced the importance of certain things, it is still a faithful representation of the Mitchell’s work. -The book starts out in Paris, where Jake Barnes is done with the whole café scene. 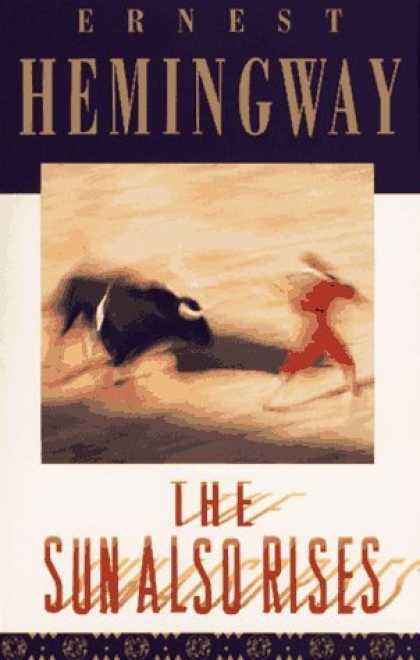 He and his group of friends head to Pamplona on holiday. The basic idea is simple, but the characters are what makes it a great book. Hemingway played a bit with gender, because even though all of the men seem to fall in love with Brett, she’s the one in charge. She knows exactly what she’s doing. Then there’s Pedro Romero, the teenage bullfighting phenom, who gets swept into their circle and their antics. The Sun Also Rises is one of those books that just spoke to me; I’m not even sure why exactly I liked it so much, I just did. I haven’t read this one in awhile, so I’m curious whether or not I’ll feel the same way. -Another book that takes place during a war, this time World War II. 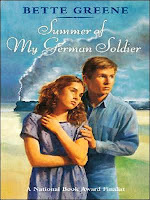 What I remember the most about Summer of My German Soldier was how sorry I felt for Patty. I’m not sure if that’s the emotion Ms. Greene was trying to elicit, but that was my prevailing emotion every time I read this book. Patty’s parents were horrible to her; she didn’t have any friends really except for her family’s housekeeper, Ruth. She tried to do what she thought was an honorable thing by “rescuing” Anton and ended up losing much more than she bargained for. One of the main messages was about acceptance, looking beyond labels to really see who the person is, that’s what I took away from this book. I chose to reread this book for another assignment and I found that I didn’t really enjoy the story as much as I when I was a teen. I think maybe it’s because I can’t put myself in Patty’s place anymore. I kept wanting to tell her to be careful and not get caught. 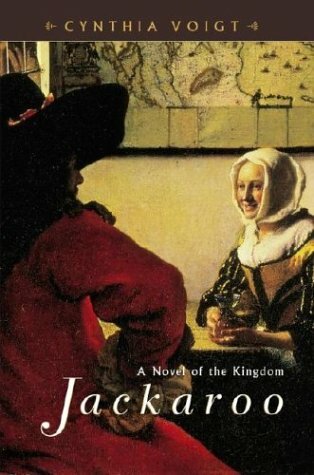 -Medieval setting, a girl donning the clothes of a legendary figure, a bit of romance, some intrigue and danger; all of these things together made me love Jackaroo. I loved it so much that when the library replaced its copy, I got to take home the discarded one. Gwyn, to me, was an intriguing character because she lived in a society where everyone looked out for themselves, put their own needs before anyone else’s. She took the time and made the effort to help others overcome their difficulties. To have that much power, to make that type of decision at 16, to me was unfathomable. Again, Jackaroo is a book that I haven’t read since high school and I wonder if it will still hold the same fascination for me now that I’m older. What were some of the books you enjoyed reading when you were a teenager? I graduated in 2003, and YA wasn't very prevalent in my teen years either. I read a lot of Stephen King. I remember reading (and enjoying) White Oleander. About half of the Harry Potter series was available during my teen years. I also read numerous classics such as The Bell Jar and To Kill A Mockingbird. That's a pretty interesting topic! I wonder what my five favorite books as a teenager are. I was able to grab a used copy of Summer of My German Soldier a couple of days ago. I haven't read it though but I hope I like it when I do. 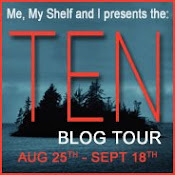 It's Friday...Time for the Book Blogger Hop!